The crumbing former Leader Dye factory which has been abandoned for more than a decade is slated for demolition. Municipal officials awarded a $1.13 million contract for the demolition of the massive structure on Madison Avenue earlier in the month. Economic development director Ruben Gomez expects the demolition to be completed by the end of January. He said that depends on the weather. 6-7 lien holders of the property were notified that their asset would be demolished, he said. “It’s an eminent hazard. No one’s moving forward to address the issue. So, we’re going to demolish,” said Gomez. Once demolished, the city will file for what’s called in rem foreclosure to take possession of the property, he said. Gomez estimates it could take six months or so to foreclose on the property. That won’t pave the way for development in that corner that has been described as an ideal spot for a big box store. “That site does have some contamination,” said Gomez. He said site investigation has to be conducted prior to a clean-up – there’s several types of clean-up that can be conducted depending on the future development on the site. For example, the environmental clean-up to build residential is more intensive and costs more than to turn the site into a parking lot or develop for warehousing. William McKoy, 3rd Ward councilman, who represents the area where the site is located, wants a development similar to what exists on McLean Boulevard. He has said in the past he would like to retail shops at the site. Gomez said a future plan for the site has to be developed following demolition. The demolition contract was awarded to Totowa-based Two Brothers Contracting on Dec. 19, 2017. A previous report in the Paterson Times erroneously stated the demolition contract had been awarded in November. Two Brothers Contracting submitted the “lowest responsible” bid for the job. 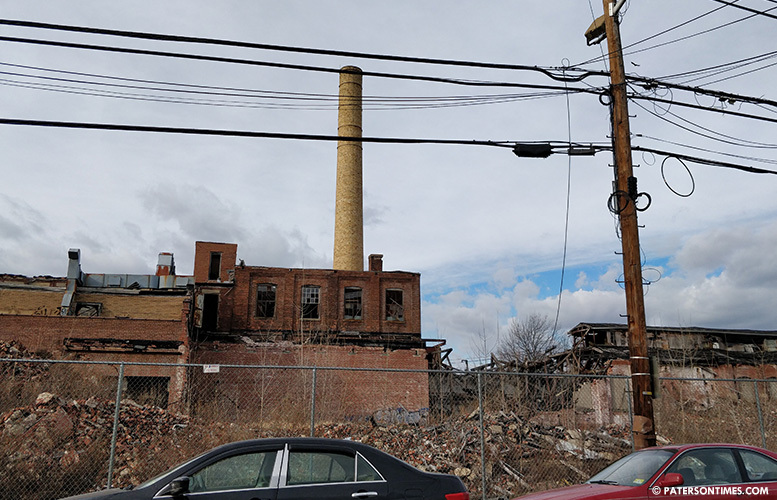 It was among five firms that submitted bids ranging from $1.13 to $2.28 million to demolish the huge factory at 102-124 Madison Avenue, according to municipal records.